The holiday season is here and we need quick and easy snacks for entertaining that can be made ahead, ideal for guests dropping by for a little holiday visit. Two operative words here are quick and easy. For these smoky roasted nuts , add two more words : delicious, and versatile. 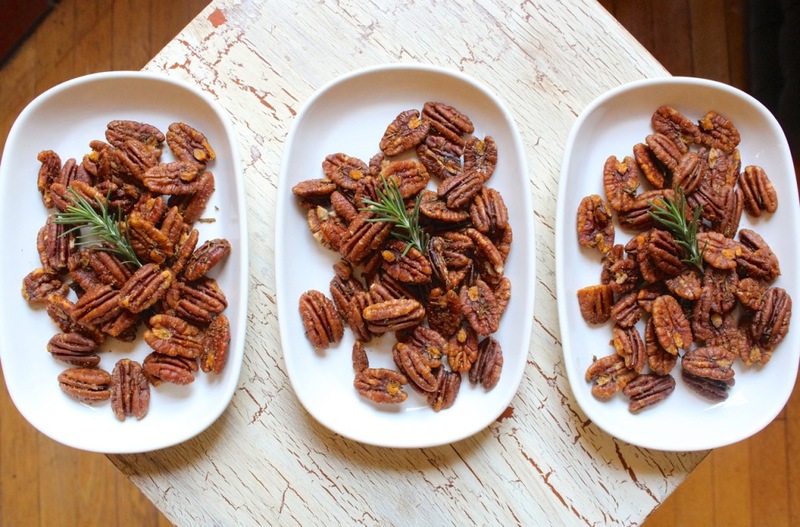 My smoky rosemary roasted pecans are an ideal accompaniment to wine, cocktails and non-alcoholic beverages. They elevate the most simple salad to exalted status when scattered atop dressed greens. Have homemade vinaigrette on hand for the healthiest salads. Use these nuts to gussy up substantial salads, too. Chopped, they give the wow factor to dips and spreads when mixed into whipped cream cheese and sour cream. Envision these nuts folded into a stuffing for roasted pork loin or seared chicken breasts. Pureed soups will appear ready for their photo shoot with an artful drizzle of creme fraiche and a few roasted pecans. Make these nuts up to a month ahead and store tightly covered at room temperature in a cool spot. Package them in pretty holiday tins or jars and give some homemade kitchen love. In mixing bowl, toss pecans with melted butter, smoked paprika and sea salt until all nuts are coated well. Add rosemary and toss until combined. With spatula, transfer nuts to ungreased heavy sheet pan and bake for 35 minutes. Let nuts cool on baking sheet and when cool transfer to airtight container. Store at room temperature in a cool spot for up to one month. This entry was posted in appetizers, condiments, gluten free, vegetarian and tagged roasted pecans, rosemary pecans, rosemary roasted pecans, smoked paprika, smoked paprika nuts on November 21, 2014 by Michele Humlan.